such as wood or Styrofoam (Barrows 1919, Miller 1926, Abbott 1940, Higgins 1956, Carlton 1979), making it susceptible to human-influenced dispersal. Sphaeroma quoianum likely was introduced to western North America from Australasia by ships from Australia coming to California for the gold rush in the mid- to late-1800s (Carlton 1979). It was first reported in San Francisco Bay in 1893 and, since the turn of the twentieth century, has spread to several bays, from Bahia de San Quintin in Baja California, Mexico, to Yaquina Bay, Oregon (Carlton 1979, T. Davidson personal communication). Although this isopod can burrow into a variety of available substrata, its preferred habitats in this range are the peat and mud banks of tidal creeks and marshes (Figure 9.1). Relatively little is known about the effect of the isopod in its native range. 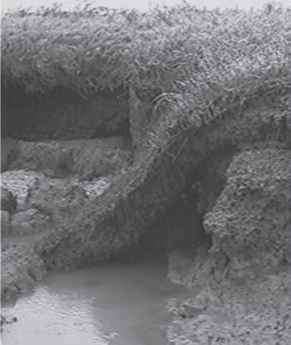 Where it has been introduced, however, the high-density and intensive burrowing activity of S. quoianum have been observed to weaken mud and clay banks of salt marsh edges, thus making them more susceptible to erosion by wave action or creek flow than in uninvaded areas, even in the presence of native burrowers (Carlton 1979, Josselyn 1983, Nichols and Pamatmat 1988). Carlton (1979) estimates that in some areas of San Francisco Bay, tens of meters or more of marsh edge had been lost since the introduction of this isopod at the end of the nineteenth century, and that this species was likely one of the most important agents of shoreline erosion (e.g., Figures 9.2 and 9.3). To excavate the burrows in which it lives and eats, S. quoianum faces headfirst into the substrate and creates a current with its pleopods that passes forward over the dorsum, down in front of the head, under the body to the posterior end, and out of the forming burrow (Rotramel 1975). It breaks off substrate with its mandibles and releases the particles near its midline so that they are washed out of the burrow by the current, without being caught in the feeding brushes on the first and third legs (Rotramel 1975). S. quoianum does not appear to feed on its burrow substrate, and is thought to filter-feed by using a similar current as that used for burrowing. The action of the pleopods brings water into the burrow, over the isopod, and through the brushes on the front legs, thereby trapping particles. The pleopods occasionally stop beating and the isopod cleans the brushes with its maxillipeds (Rotramel 1975). (= Salicornia virginica), the dominant plant found in the marsh plain above burrows (8Ci3 = -24.5 ± 1.3, 8Ni5 = 4.5 ± 1.6), or the belowground organic material (SC13 = -21.9 ± 1.8, 8N15 = 8.9 ± 0.1) found in the vicinity of its burrows. excavations that were generally somewhat horizontal and averaged 0.6 cm width and 2.2 cm length, with a maximum length of nearly 6 cm. When present, burrows occupied 3-15% of the volume of the outer 5 cm of marsh bank sediments (Talley et al. 2001). Densities of S. quoianum burrows were highly correlated with densities of the isopod itself, but the burrows were more persistent than isopod, with visually assessed densities remaining similar throughout the year of the study even though densities of the isopod were up to 13 x lower in the winter (Talley et al. 2001). 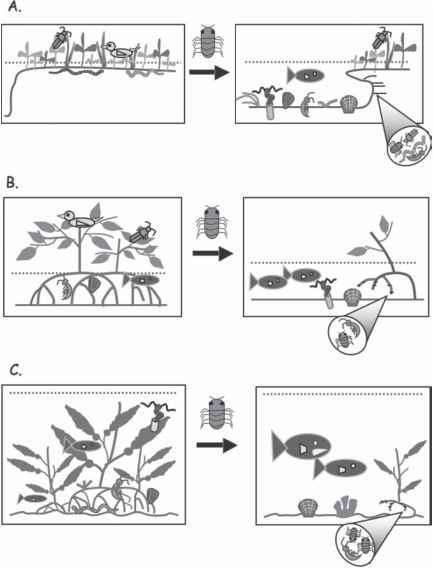 The explicit consideration of this persistence of an organism's structural modification beyond the life span of the organism itself is an advantage of the engineering concept—as opposed to consideration of traditional biotic interactions (e.g., predator-prey relationships), engineering readily accounts for direct effects that outlast the species that created them (Hastings et al. 2007). FIGURE 9.4 Relationship between undercutting of marsh banks and (A) Sphaeroma quoianum burrow density and (B) the density of S. quoianum individuals. Undercutting was measured as the largest distance from a vertical pole set on end on the creek bottom or tidal flat surface and aligned parallel to and touching the top surface of the bank (i.e., a true vertical bank distance would be ~0 cm). Burrow density was assessed visually, and ranked on a scale of 0 (low) to 2 (many). Data were collected in July 1998 from San Diego Bay and San Francisco Bay, n = 45 sampling stations (see Talley et al. 2001 for more information). 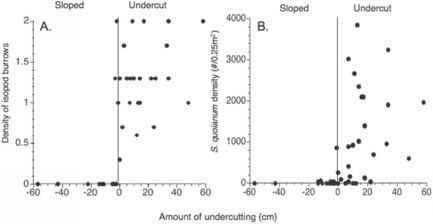 Data demonstrate a clear threshold, with few burrows or individuals on nonundercut banks and more burrows and individuals on undercut densities tended to have the most undercut bank faces (Figure 9.4A). Also, the density of isopods themselves were significantly correlated with bank undercutting (p = 0.0006, F143 = 14, R2 = 0.25; Figure 9.4B). The isopod-induced bank erosion and subsequent undercutting led to the eventual collapse of sections of bank (Figure 9.2). Measures of marsh edge lateral loss averaged 15 ± 3 cm year-1 in San Diego and 27 ± 7 cm year-1 in San Francisco, with losses as high as 112 cm year-1 (Talley et al. 2001). Losses of over 60 cm occurred when sections of marsh bank (overhangs) fell to the surface below (Figure 9.3). Loss due to slumping was most common on the bay front marsh edge in San Francisco Bay where wave energy appeared to be highest due to large boat and ferry traffic (Talley et al. 2001; Figure 9.3). Batis maritima, Jaumea carnosa, Distichlis spicata, and Spartina foliosa). These species are themselves ecosystem engineers, as they provide aboveground and belowground physical structure affecting abiotic conditions such as hydrodynamics, shading, sediment deposition, and bank stabilization (e.g., Leonard and Luther 1995, Hacker and Bertness 1999, Cavatorta et al. 2003). While isopod-induced horizontal loss of marsh reduces habitat area for these species and the biota associated with them, there would be a gain in the mudflat and creek-bottom habitat created as a result of marsh loss (Figure 9.1A). Although not quantified, logically this habitat conversion would tend to favor a different suite of species than that supported by the vegetated marsh. For example, one might expect transitions from a predominance of organisms with terrestrial traits such as insects, oligochaetes, pulmonate snails, mammals, and songbirds to those with marine traits such as polychaetes, bivalves, fish, and migratory shorebirds (e.g., Szedlmayer and Able 1996, Levin et al. 1998, Talley personal observation; Figure 9.1A). Habitat also appeared to be created at smaller spatio-temporal scales, through the increase in the structural complexity of marsh banks (Figure 9.1A). Surveys were conducted in both bays to determine the effects that the invasion of this isopod was having on the associated marsh benthic community (Levin et al. unpublished data). Benthic samples were taken equidistantly from vertical banks along each reach of salt marsh banks used in the study, for a total of nearly 50 15 cm diameter x 5 cm deep cores per bay. Each core was washed after preservation through 0.3 mm mesh, and all macrofauna (fauna >0.3 mm) were identified and enumerated (estimates do not include the presence or abundance of S. quoianum or its often-present commensal isopod, Iais californica). For the benthic macrofauna, higher densities of S. quoianum were associated with greater species richness (R2 = 0.21, P < 0.001, F151 = 13.5) and higher total numbers of fauna (R2 = 0.15, P = 0.003, F152 = 9.4) in San Francisco Bay, but not in San Diego Bay (p > 0.66). Densities of several taxa increased with higher S. quoianum numbers. Other peracarid crustaceans had the strongest association in both bays (SF: R2 = 0.30, P < 0.001, F1i52 = 22.6; SD: R2 = 0.40, P < 0.001, Fi>45 = 30.1), and, in San Francisco Bay, densities of most insect, polychaete, and enchytraeid oligochaete taxa also increased in association with S. quoianum (R2 = 0.11 - 0.16, P = 0.003 - 0.01, F152 = 6.6 - 9.9). The taxa in both bays that tended to decline with increased S. quoianum were those normally associated with anaerobic conditions, such as tubificid oligochaetes and capitellid polychaetes (R2 = 0.10 - 0.37, P = <0.001 - 0.04, F = 4.5 - 29.7). In these descriptive studies, the individual effects on the benthos by the isopod, its burrows, and the resulting abiotic alterations were not separated, but could be by performing future experiments using artificial burrows and/or abiotic manipulations in order to separate biotic from abiotic effects of the species. Overall, S. quoianum has the potential to dramatically alter wetland ecosystems (Carlton 1979, Talley et al. 2001). Locally, the increase in habitat heterogeneity created by isopod burrows can facilitate some suites of resident biota (while inhibiting others). At larger spatiotemporal scales, the isopod can convert high-elevation, vegetated salt marsh into low-elevation, unvegetated flats. The quantitative assessment of both the rate and the biotic consequences of this conversion require additional study, however. This work should focus on decoupling isopod-induced erosion rates from background rates due to both natural and other anthropogenic factors (e.g., boat wake). Quantitative assessment of isopod effects on the larger complex of vegetated marsh and unvegetated flats will require explicit sampling of these two distinct habitat types, which will often necessitate different sampling strategies and comparisons across taxa not typically considered together (e.g., birds vs. fish). Despite these uncertainties, the general effects of S. quoianum invasion are clear enough to warrant conservation concern and management action. Although we argue that "habitat" is not truly being lost, just being converted, this transformation from vegetated marsh to unvegetated flats within invaded areas is largely undesirable. On the West Coast of the United States, much salt marsh habitat has been lost to human development and remaining areas are often encroached upon, no longer able to migrate upland and compensate for loss due to sea level rise and waterfront erosion. Yet, these marshes support a number of endangered and threatened species (Mitsch and Gosselink 2000). A principal goal for S. quoianum management should be to limit the spread of this species to uninfested systems, which appears chiefly to occur through human-aided transport on wood or man-made materials. The potential for this species to be transported in plant material being used for marsh restoration efforts also warrants concern. 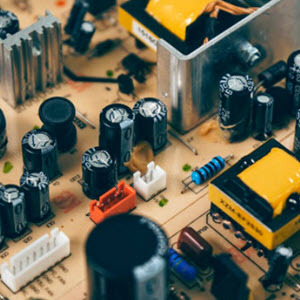 In terms of restoration design, within infested areas it will also be beneficial to recognize the factors that limit the engineering activity of the isopod, such as bank slope, and where possible create systems that will not promote extensive isopod burrowing or accelerated erosion rates. Assessments of invasion risk could also be considered with appropriate landscape planning of proportions of habitat type that would account for future habitat conversion.